Three-day exercise included over 10,000 terrorists, according to Lebanese newspaper. Terror-guerrilla organization and Iranian proxy Hizbullah held a three-day-long exercise this week, according to Lebanese newspaper Al Joumhouria. The drill included over 10,000 men and was unprecedented in its scope, the newspaper reported. The organization's director Hassan Nasrallah reportedly supervised part of the drill, flanked by several officers from the Iranian Revolutionary Guards. Hizbullah's new elite units rehearsed fighting against tanks and helicopters in the exercise, according to the report. 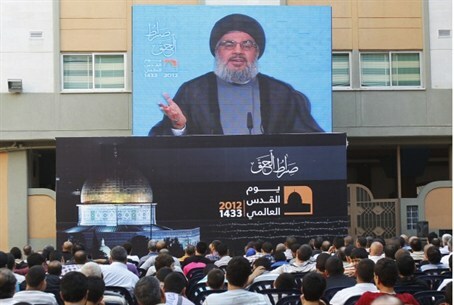 A senior Hizbullah terrorist said the forces rehearsed defense against an Israeli invasion as well as an offensive move to conquer parts of the Galilee. The senior Iranian officers who viewed the exercise reportedly took 2,000 of the men to Iran with them for additional training.